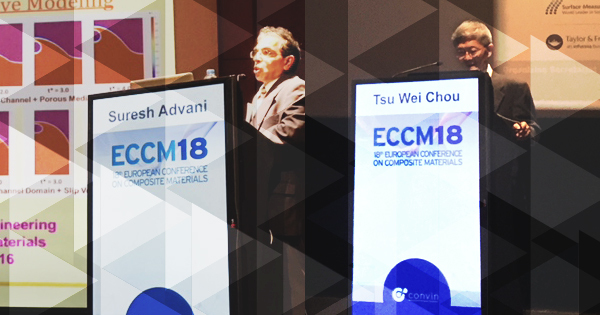 Two mechanical engineering professors from the University of Delaware had starring roles at the 18th European Conference on Composite Materials, which was held in June in Athens, Greece. UD’s Tsu-Wei Chou, Unidel Pierre S. du Pont Chair of Mechanical Engineering, gave a plenary lecture, Nanocarbon-based Functional Composites, in which he shared how the foundation of composite materials led to his discoveries of additional functionalities of such materials that could be used for many applications in automotive and aerospace applications. Suresh Advani, George W. Laird Professor of Mechanical Engineering, gave a keynote speech, Void Reduction in Composite Processing: Mechanisms, Processes and Predictive Modeling. In his talk, he explained how fluid mechanics, heat transfer and rheology of materials can be the underpinning to advance manufacturing practice of composites. The conference had about 1,200 attendees from 65 countries. Both Chou and Advani are affiliated with the Center for Composite Materials, an internationally recognized, interdisciplinary center of excellence for composites research and education at UD.